15 August 2014 found me perched on a log at the waters edge below the steep forested bank of the Salmon River, 7 km southwest of Chipman, New Brunswick. time it took me to apply my underpainting and rough in the far bank. First the sky filled with bright fluffy clouds, and then it emptied to a distant layer of of cumulus hugging the horizon beneath a clear vault of ultramarine. I took photos as the sky changed, and chose the first view to use as reference for finishing the painting later. I'm not yet as fast at capturing fast-moving skies as my "Weatherman" artist friend and colleague, Phil Chadwick. The far bank in this scene is low and marshy, but on our side the bank rises close behind my perch at the water's edge, clothed in Birches and young conifers, a fascinatingly rugged forested topography of steep hills and mysterious ridges all made of broken and crushed rock left by a century of coal mining in the area. We hadn't known about any coal mining in New Brunswick, so this landscape was a complete surprise to us, as we're always fascinated by the process of recolonization of disturbed sites, and by the hope that species of specialized habitats may find a home there. "Coal brought a level of financial prosperity to the nearby community of Minto in the early 1900s, which by the late 1930s turned into a profitable venture for companies, and brought starvation and disease to a then impoverished community. Early in the coal mining, land owners were permitted to mine under their own land without obtaining a license from the Crown or paying any royalties, which ended in 1915. During the early years of the Great Depression, the New Brunswick Power Corporation built the province's first thermal generating station on the shores of Grand Lake. By 1931, an NB Power subsidiary, NB Coal, was the only mining company left in the area and performed strip mining. NB Power closed the Grand Lake Station in 2010, and by this time all coal mining in the area had ended." While at the Bio-blitz in Gagetown, Fred and I were asked by the documentary team, Lloyd Salomone & Kent Martin, if they could film us exploring and painting at one of our Energy East crossings. Following Fred's GPS waypoint for the Energy East Pipeline crossing of the Salmon River, we drove to the end of a small road at "Ironbound Cove Cemetery". As we introduced our project for the camera, Northern Nighthawk "beented" overhead and Cicadas whined in the birches shading the edge of the graveyard. Along the gravelly slope down to the river, we found signs of an opened Painted Turtle nest. The Coltsfoot, and Red and White Clovers were popping with grasshoppers, our predictor for the absence of Leopard Frogs (which do their insect hunting on land) and indeed, we saw none all the way down to the river. We followed a boatlaunch track past an uninhabited cabin, to a little bay of Yellow Waterlilies where we pushed through long grasses and then picked our way along the narrow stony river edge past the Hydro pylons, looking for a painting scene downstream of the planned pipeline crossing. Stepping precariously along the steep shale/sandstone-fragment shore we picked up scattered Unionid shells - Eastern Elliptio, Eastern Lamp-Mussel, and Alewife Floater. Fred collected water-edge drifted material by best-sorted handsfulls of dry drift from 3-5 m up the nearly vertical bank. No snail shells seen in this drift. But there were young Green and Bull Frogs, and lots of signs of creative Beaver activity along the shore. As I settled down to paint a downstream scene, I heard Ravens and Blue Jays, an Osprey, and another Nighthawk. After being filmed I packed up under a sky that had changed three times since I started, and decided, in stead of working my way past the logs and Sweetgale bushes that crowded the shore, to return along the forested ridge that Kent and Lloyd had taken to come down to me - so I climbed up from trunk to trunk of the young birches and Pin Cherries, and then followed the narrow ridge back to the giant legs of the hydro pylon and down to the boat launch to a buzzing Hummingbird territorial Kingbirds. 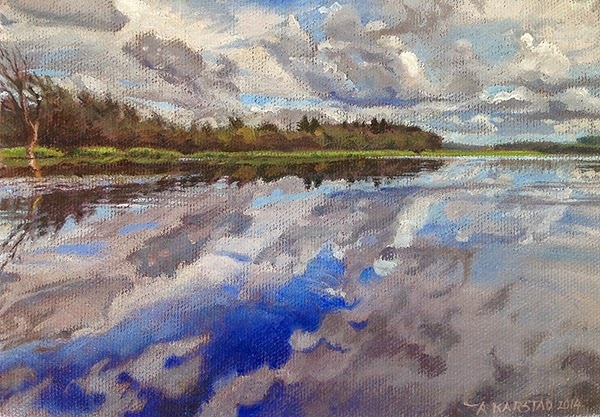 The original oil painting, "Salmon River Cloudscape" is available for $350 to support our exploration of the proposed route of the Energy East Pipeline. Please contact Aleta at karstad(at)pinicola(dot)ca. 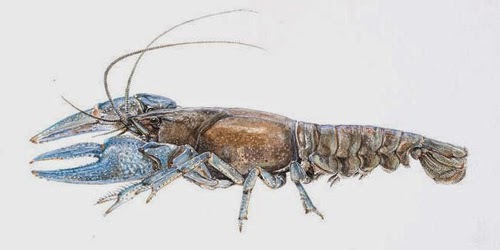 This blog reports the Landscape Art & Science visits of biologist Frederick W. Schueler and artist Aleta Karstad to wetlands and watercourses close to sites of proposed industrial activity. Our mission is to visit these places and put their fauna and flora on the public record so that natural communities, vulnerable species, and their essential support system can be taken into consideration when decisions are made. The sale of Aleta's paintings of vulnerable sites supports our work.